This blog is now located at http://cprr-discussion-group.blogspot.com/. You will be automatically redirected in 5 seconds, or you may click here. For feed subscribers, please update your feed subscriptions to http://cprr.org/CPRR_Discussion_Group. 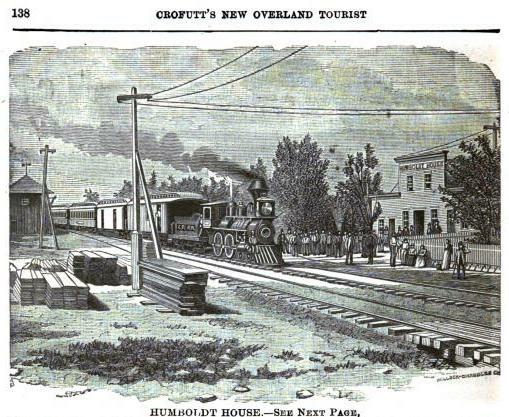 Hillsdale College Professor Burt Folsom writes that " ... James J. Hill privately financed his Great Northern Railroad–the only transcontinental railroad never to go bankrupt. By contrast, the Union Pacific and Central Pacific Railroads–with massive federal aid–both went broke during the 1890s and both consumed millions of taxpayer dollars in financing." By contrast, our understanding is that the Central and Union Pacific Railroads did not receive government subsidies because the government railroad bonds had to be and were repaid in full with interest, that according to the U.S. Supreme Court the government and the railroads shared equally in the increased value of the land grants, and that the U.S. government got a billion dollar discount on mail and other transportation costs. So although the CPRR spoke of a "subsidy" in their bond prospectus, the net economic result was that the bonds were a repaid loan (not that the railroad didn't attempt unsuccessfully to avoid repaying), the worthless western lands to the extent they were made valuable by the completion of the railroad (much was so arid that it remained worthless), more of the value went to the government and eventual landowners than to the railroad, and the U.S. government received a financial windfall due to the prolonged subsidy that the railroads provided to the U.S. government for its transportation costs as part of the deal to fund the construction. Role of government in railroad financing. "Railroad Reorganization: Union Pacific." By Stuart Daggett, Ph.D., Harvard Economic Studies, 1908, states on page 256 that: " ... the government debt was paid off in cash ... both principal and interest were paid in full." Regarding the CPRR and Western Pacific RR, Tutorow, p. 1004 reports that final payment to the government was organized by a commission appointed by an 1898 act of congress, determined to be $58,812,715.48 on Feb. 1, 1899, and that the complex transaction was completed on February 1, 1909 when the last of the government debt was duly paid. So which is correct? Did both the CPRR & UPRR go broke and consume millions of taxpayer dollars or was the debt repaid in full plus the U.S. government received a financial windfall due to the prolonged subsidy that the railroads provided to the government for its transportation costs through the mid 20th century? New website SepiaTown - Over 150 mapped historical San Francisco images for you to explore! SepiaTown is a website (mobile version coming soon) that lets people experience the past through a large and growing collection of user-submitted, mapped historical images. We already have over 150 mapped San Francisco images in the collection for you to explore, plus images from a host of cities around the world. In the coming months we'll be adding a number of new features to the site: mobile version, filtering by date and media type, film and audio upload, plus individualized pages for registered users. If you have historical images you'd like to share, we invite you to upload, map and share them through the SepiaTown collection. Registration is fast and free, and our upload and mapping process is as easy as pie, and each image features a link to your site (if you so choose). Please feel free to contact us with any ideas or questions. If you like the project, we'd greatly appreciate it if you could help us get the word out. I am researching a mid 19th Century painting that had an association possibly with 303 Broadway as it existed in the period of o/a 1850-60. I note that CPRR's 1870 address for its NYC office was at 303 Broadway. I note the voluminous and interesting materials available on your website, but couldn't see anything regarding history of the various physical office sites. Thus, I was wondering if you might have any such information for my research regarding that building at 303 Broadway (i.e. pre/post 1870 building description, occupants, even immediately adjacent buildings*, etc.) That particular area/time was one where there were many artists and theatres in that area of NYC, but the NYC Landmarks Commission does not have this address within its current designated areas. Thus, any historic info on the building itself would be much appreciated. I am working on a travel book, A Traveler's Own Book, that the Central Pacific Railroad photographer Alfred Hart published in 1870. In particular, I'm trying to get a date for when it stopped publication, and I have come across a clue that I'm hoping someone can help me with. 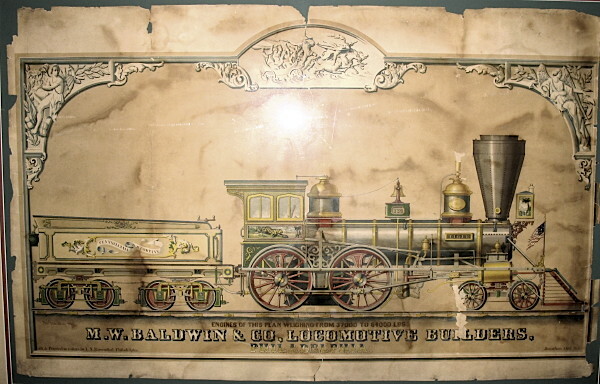 In what I think is a later edition of the booklet, the map in the back has the Burlington & Missouri Railroad bypassing Omaha and going through Lincoln, Nebraska before heading north again and linking up to the Union Pacific and heading west. Does anyone know when this bypass of Omaha was completed? We have Union Pacific and Southern Pacific Railroad publicity photos and are trying to find out what they are worth. Can you help us or direct us. Any assistance you can give us would be greatly appreciated. What was the final cost of the construction of the transcontinental railroad? How much was paid to the railroad companies per mile? What were some animals back in the 1870s in Nebraska through California? I am working on a model 50' Passenger car by (Roundhouse) and I am interested as to where I could find any information on interior drawings, and to know what type trucks are prototypical for these cars, can you help me with this??? Have you ever noticed these two views of Humboldt House are exactly the same? The red background is a no no!!! Makes it very hard to read. Also, not good for those who are low vision. Please get rid of it! ... My husband's grandfather, Frank J. Douglas, was yardmaster for several years in the early 1900's at Port Costa. We have visited Port Costa on several occasions; there is basically no rail yard/buildings remaining at Port Costa. We would really like to see any photos of the Port Costa and Benicia rail yards that transferred the freight via the "Solano". I see a lot of photos of the Solano, but very little of the ports and the port personnel. We have, in our family archive, three photos of a group of men posed in front of an engine and a small building nearby. There is no identifying information, but we are certain that one of the men was Frank J. Douglas. The family story is that Frank was one of the youngest men ever to attain yard master status. He apparently trained at Denison, TX. I enjoyed browsing your site today...especially the old pictures. I have a question, my father has an old family photograph. The bottom says DRUM, Rail Road Photo Car ... it's printed on stiff card stock type paper. Can you tell me how I can know which rail road car this picture came from? It's of two men ... unfortunately, we don't know who ... we believe it's our Hutcheson family who went through Iowa and into Kansas. A. J. Russell Stereoview #539. "Chinese at Laying Last Rail UPRR." I am a little confused by all the explanations. 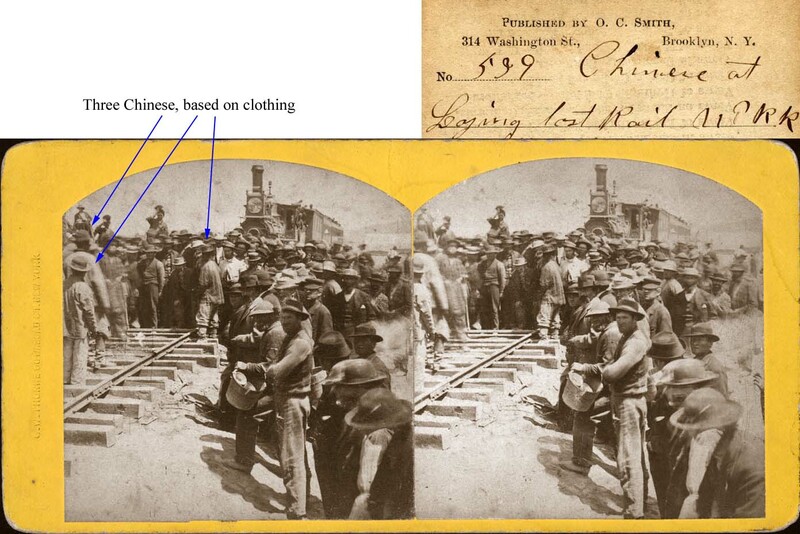 ... the photo of the completion of the Intercontinental [sic] Railroad that, according to your website's caption, depicts at least one Chinese worker. ... can you tell me which individual is definitely Chinese? Is this a version of the photo with an enlargement of the relevant section? Is your identification made on the basis of clothing, facial features, or what? Given the quality of the photo, it is difficult for me to make this identification, based on viewing the image on my computer screen.
" ... Despite their hard work, the Chinese still faced discrimination. They experienced more difficult conditions than the white workers while receiving less pay for their work. In 1867, the Chinese workers organized a strike demanding higher pay and safer working conditions. The officials ignored their demands and forced them the workers to return to work." History of Reno, Nevada railroad depots. There was in fact a California Pacific Rail Road operating between Sacramento and Vallejo with a branch from Davis to Marysville at this time. Several of Denny’s views that I have seen (online) only make sense if Denny was photographing the California Pacific. However, there have been some references to Central Pacific Rail Road views published in the “California Pacific Railroad” series “some of which may have been from negatives by Alfred A. Hart” (Palmquist, Pioneer Photographers of the Far West, pg. 200). I have one of these views, a variant of Hart 61 Hydraulic Mining, in my collection. There is also an interesting CDV take by Denny of “Virginia Street, Reno” in the Union Pacific Museum. Item X364 from the Southern Pacific Collection. It is quite similar of Hart 286 of the same name and appears to have been taken about (but not exactly) the same time. See Myrick, Railroads of Nevada, pg. 15. I would like to obtain more examples (copies?) of Oliver Denny’s images so that more light may be shed on the subject. Any information would be helpful. How many snowsheds were built through the Sierra Nevada Mountains at the time the railroad was built? How many bridges/trestles were built through the Sierra Nevada Mountains at the time the railroad was built? 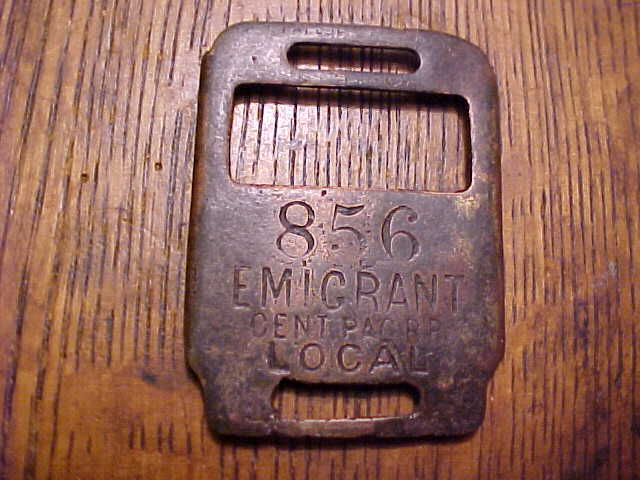 Looking to Trade CPRR Emigrant Baggage Tags for Iron. 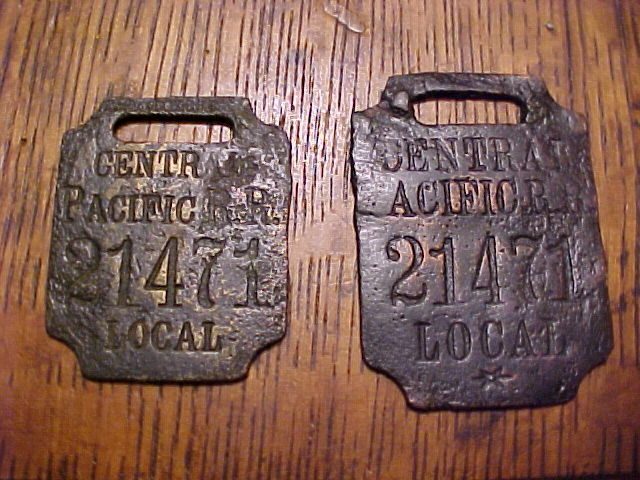 I have a matched pair of Central Pacific Hoole Emigrant Tags that I am looking to trade for some Central Pacific iron. I am interested in link and pin coupler set, journal box covers, and tools. 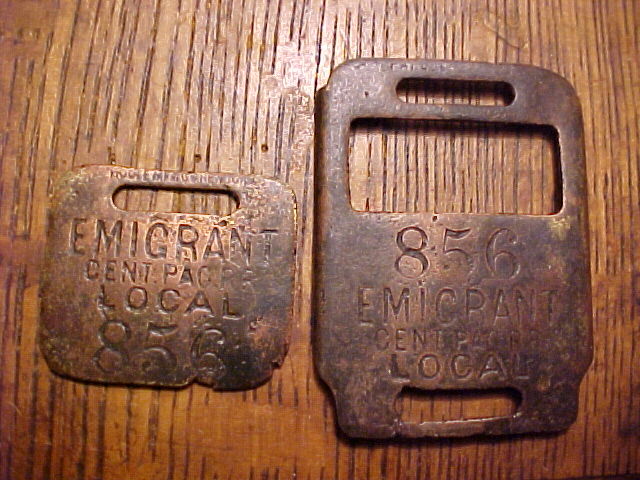 If you have extra iron and would like to acquire these extremely rare tags please contact me for information and pictures. I also have a pair of Wilcox tags available. Do you know what ever happened to the old steam locomotive that was used as a hoisting engine for the mid-way vertical shaft on CPRR's Summit tunnel (tunnel no. 6)?? It was originally known as the "Sacramento" and belonged to the Sacramento Valley Railroad before CPRR bought it. Evidence that the Central Pacific did at least try power drills in Summit Tunnel. I wonder what patents the drills were built under. Vulcan Iron works built "atmospheric drilling machines", four of which were used by the Central Pacific in Summit Tunnel. Drilled 1 1/2" holes for nitro-glycerin. Drilled at rate of 1 1/2" per minute. Air supplied by air pump – steam powered - on surface. I'm writing a curriculum on the Chinese building the railroad. I need a small detail: How much did a sledge hammer weigh? If no one can answer that question, can you direct me to someone who can? Thank you. Please let me introduce myself and to explain our Research Library's goals. I am Chaun Owens-Mortier, Research Historian for the Truckee Donner Historical Society. This summer we opened our Research Library for the first time. Myself, our Research Librarian; Katie Holley along with our Photo Archivist, Dennis Beegley are creating a complete archival database of our in-house resources. 19) E.B. Crocker to Huntington, 1 August 1867; confirmed in Sacramento Bee (3 August 1867) and Gold Hill Daily News (6 August 1867). Subsequent use of the name Coburn's in the newspapers and by railroad officials, and the fact that the name change was announced again the following spring in the Sacramento Union (11 April 1868) and the Virginia City Territorial Enterprise (14 April 1868) indicate that the new name was not immediately adopted. I am contacting the Virginia City Historical society in an attempt to gain a copy of the article from their area but I am requesting assistance from your organization to obtain copies of the other sources noted. Do you have copies of the correspondence between E.B. Crocker to Huntington and copies of the news articles from the Sacramento Bee, Gold Hill Daily News and the Sacramento Union? If you do can we obtain photocopies of those for our records? If not, can you direct me as to where I can obtain those copies. I have located advertisements in the Truckee Republican from September/October of 1868 where business are still saying they are in Coburn's Station so the statement that the new name was not readily accepted is a very true fact but we would be grateful to have the correct information in file as to when the name was actually changed. "Clearance project: 'designed to move customer products over a shorter, faster, and more efficient route,' Union Pacific’s Donner Pass route is open to doublestack intermodal traffic." To understand the history and significance of the first Thanksgiving in November, 1623 read the journal of Pilgrim Governor William Bradford. The Mayflower Compact set up a commune at the Plymouth Bay Colony with equal collective ownership, hence destroyed all incentive and half the Pilgrims starved to death. This disastrous socialist experiment was successfully replaced with capitalist individual farm plots on their plantation according to Bradford so that the Pilgrims would be incentivized by benefiting from their own individual efforts, and with farming knowledge learned from the local Indians, food became abundant leading to the first Thanksgiving celebration and subsequent success of the colony. No. 1360: 4-4-0, originally: ? No. 1779: 4-6-0. originally: ? Unfortuneately, when I tried to look them up on the rosters, I couldn't find either of them. I saw locomotives numbered 1362-1368, and locomotives numbered 1770-1776, but no engines with these numbers. Does anyone happen to know if they engines were even SP/CP, or were they from another RR, or did I miss something entirely? The other question I had was about an SP locomotive I saw in a book once, numbered 1008. However, it is very different from the one listed. The engine is a 4-4-0T, with no tender, a crane attached to the smokebox/pilot, and a small collection of tanks and cylinders under the cab. I own a copy of the book, so I can scan it if you'd like. The engine is simply described as a works pilot, but I have never seen any of pictures of it before. Does the museum have any other resources about it? Did the Central Pacific Jupiter 4-4-0 Locomotive have Hi-Rail Wheels or Scale Wheels? I wanted to let you know about a new project that the Spatial History Lab at Stanford is working on. They (we) are mapping the locations of Alfred Hart's photos along the CPRR and pairing each with a repeat photograph from the same spot. It's been fascinating thus far to see the changes in the landscape over the ensuing 150 years. The project is still in progress (winter snows in the mountains will stall further photos during the winter) but we're excited about the contrasts we've seen already. I wanted to let you all know about the project not only because it seems in line with your interests, but because we would love your input. I'm sure there are details we're missing and whole stories that we've forgotten. If you know anything more about the photos, please do let us know. The link to the site is: Spatial History Project – A.A. Hart Visualizations. You can navigate through the photos (we only have the first nine up now, with more to come in the very near future) both spatially and linearly. Looking for information on someone who I think either worked for the CPRR or the SP. A google search has turned up nothing, maybe someone in your group can help me? John Leroy Minchin. I'm trying to find out about this person. I'm a railroad collector and have a railroad "presentation" lantern that was given to JOHN LEROY MINCHIN with a date of 1886 on it. Can you help me? Thanks. "Unique Crocker Family Stories Come to Light in Exhibition"
My family has found what appears to be a toilet off of the central pacific railroad. It's rounded and on the front it says please do not clean the toilet bowl outside of the window, Central Pacific RR. Those are not the exact words, but it's close. I was wondering if something like this has been found before, and if it's really a part of the train. Do you have employment records from 1915-1920? The following message sent to the Clinton Transition Team on December 15, 1992 is still valid, and politicians are still misdiagnosing the problem leading them to advocate changes that will make matters much worse and more expensive. Economics Professor and Nobel Laureate Milton Friedman wrote in 1992 regarding the following proposal for a Medical Savings Account with linked variable deductible major medical insurance that “Your health insurance reform, except for details, is identical with one that I have long favored. ... I agree with you completely in what you regard as the fatal flaw.” This solution to health care reform provides universal coverage for 100% of medical expenses (unlimited), with cost consciousness because patients (not government or insurance companies) are put in charge! ... it has tons of links to Stereo View collections, plus other photography collections like Lantern Slides, early photography, camera time lines and more. I even added it to my lesson plans; the kids loved it. Let me know if you decide to incorporate it! I'm doing research on a play and wanted to know how and why Pullman cars were named and by whom.